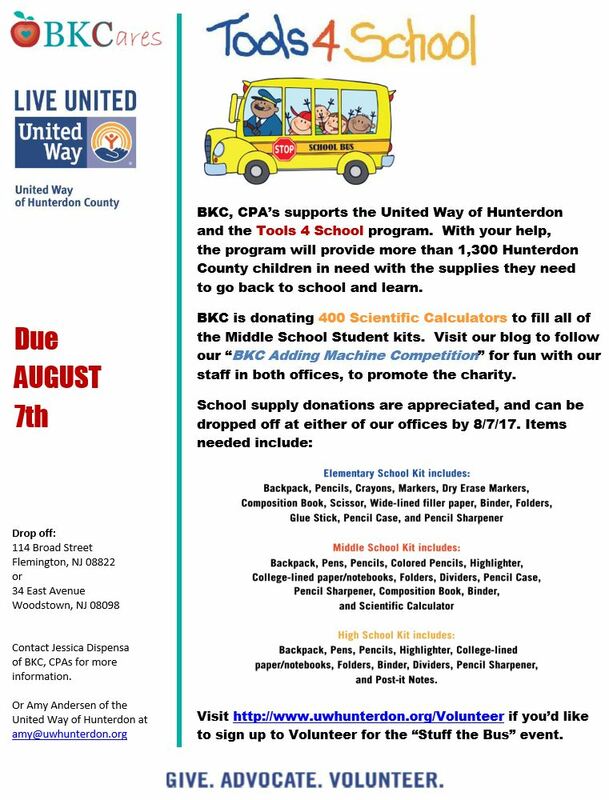 BKC, CPA’s supports the United Way of Hunterdon and the Tools 4 School program. With your help, the program will provide more than 1,300 Hunterdon County children in need with the supplies they need to go back to school and learn. BKC is donating 400 Scientific Calculators to fill all of the Middle School Student kits. Visit our blog to follow our “BKC Adding Machine Competition” for fun with our staff in both offices, to promote the charity. School supply donations are appreciated, and can be dropped off at either of our offices by 8/7/17. Please see the image attached above for a list of desired items. Visit http://www.uwhunterdon.org/Volunteer if you’d like to sign up to Volunteer for the “Stuff the Bus” event.